Our album of the month is My Morning Jacket's stellar fourth LP, Z. To commemorate our exclusive edition, we had writer Jeff Weiss write these Liner Notes for the album, which celebrates "the potential inherent in each day." Before they blew up, My Morning Jacket nearly imploded. Consider the parallel dystopia where the Louisville quintet dissolves before recording and releasing their 2005 masterpiece, Z. Stripped of its marquee band, Bonnaroo crumbles into a progressive bluegrass festival, crippled by marginal mandolin ensembles. Without Jim James, sales of Flying V guitars dwindle, forcing Gibson into bankruptcy and putting thousands of Americans out of work. James ultimately re-enrolls at the University of Kentucky and winds up the world’s most lustrously coiffed art therapist. That’s what almost happened in January of 2004. A withering tour schedule caused their guitarist and keyboardist to quit, forcing the remaining trio to contemplate their artistic mortality. A major label deal and the opportunity to beer bong Coors Lights with Dave Grohl couldn’t dissuade guitarist Johnny Quaid and keyboardist Danny Cash from tendering their resignations. Music history is replete with management disaster stories, but in this case, the band’s team salvaged the ship. Begrudgingly, MMJ agreed to open auditions in LA, a dragnet that wrangled Carl Broemel and Bo Koster, whose contributions dramatically amplified their versatility. In addition to rhythm guitar, Broemel played steel pedal and the saxophone. Koster gave the Kentuckians an ex-Berklee student whose Moog synths, Korg Trident, and Fender Rhodes stabs added a numinous psychedelia absent from their earlier albums. After another grueling tour stretch, they regrouped to record Z at a possibly haunted mansion in the Catskill Mountains. This is the sort of ancillary detail writers include to induce “WTFs” from the reader, but bear with me and peruse this photo of Allaire Studios. It’s basically The Shining:Woodstock edition. 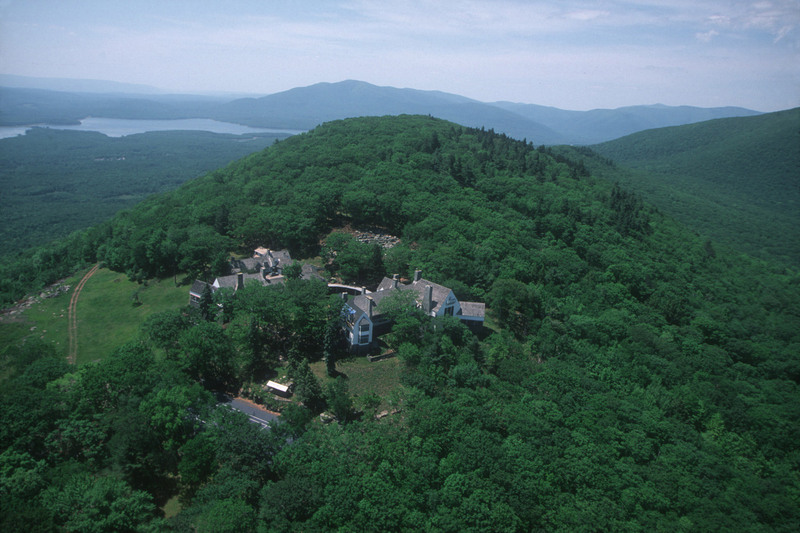 A 1920s mansion built on its own mountain, so isolated that it took a half hour just to ascend the driveway, with constant pummeling snowstorms enforcing the seclusion. You can imagine Jim James tracking a particularly labyrinthine guitar solo, taking a bathroom break and seeing two spectral twins flashing the sign of the horns in the mirror. If Outkast had the dungeon and the Fugees had the Booga Basement, My Morning Jacket had the grain silo. Their first three reverb-shrouded albums were recorded on the Quaid’s family farm. That fact was integral to their mythology, spurring incongruent Allman Brothers and Lynyrd Skynyrd comparisons, and ensuring that critics lumped them into a “country-fried,” “bourbon-soaked” Southern Rock lineage. Z obliterated every misperception and cliché. This was a new lineup recording in a foreign location, enlisting an outside producer for the first time. In came John Leckie, the producer of Radiohead’s The Bends, who spent the first half of the 70s working as a tape operator at Abbey Road, earning credits on Dark Side of the Moon, Plastic Ono Band, and George Harrison’s All Things Must Pass.His aegis directly aligned the band with its heroes, and didn’t make people shy of praising them as the American Radiohead. ButZ was the album when the analogies became irrelevant. Even if MMJ matched Wilco and the Flaming Lips as the only mid-00s U.S. rock bands earning serious comparisons with Oxford’s most seraphic mopers, their brand of sincere-but- whimsical, enthusiastic-but-skeptical, goofball guitar pyrotechnics could only come from the middle of the country. Unlike their somber coastal peers in bespoke suits, MMJ lacked archness, the irony of the entitled, and the abstractions that usually lead to creative cul-de-sacs. There was the spring where My Morning Jacket threw an ersatz prom and burned down Athens in teal Dumb and Dumber tuxes. There was the New Year’s at the Fillmore where they concocted an Oregon Trailtheme, complete with stuffed coyotes and pioneer costumes, sudden deaths and triumphant resurrections, Kool and the Gang, AC/DC, and George Michael covers, and enough flying V’s, whirling hair, and concussive power to close the gap between kids who grew up watching Dazed and Confused and their parents that lived through it. Zpresented the receipts, exemplifying everything that made them the greatest straight-up rock band of the era (alongside the White Stripes.) It reverberated with the lysergic purity of the early ‘70s without the arena rock pretensions of the back half of the decade. It channels a rock joie de vivre thought to have lapsed into senility without ever feeling “retro”—balancing blitzkrieg guitar solos with baleful piano outros, headbangers ball shredding with requiems for freshly buried friends. The Pitchfork review openedby rightfully claiming that Z “begged for vinyl,” but it ironically appeared in the dying days of the CD era. Originally shipped by Sony BMG, the first batch of discs came encoded with copy-protection software that put consumers at risk to hackers, if they uploaded it to their computer. Nonetheless, it sold over 200,000 copies, making it easily the best selling of the band’s career. For all its supernatural falsetto and skyscraping guitars, there is something simple and unadorned to the record. Recording sessions went smoothly. Only 12 or 13 songs were tracked and eventually whittled down to 10. Nor was there deeper meaning to the name, Z. “I like the shape of it,” James told Marquee Magazine shortly after the release of the album. “You can bend it to make a triangle. You can lop off one end to make a 7. I feel like it had a lot going for it. It’s also the last letter, the 26th letter in the alphabet, and I wrote all the songs when I was 26." Zis an attempt to bridge Prince with Pink Floyd, Erykah Badu with Brian Wilson, Marvin Gaye with Neil Young. If My Morning Jacket were one of the last bands to grow up without the Internet, they’re one of the first to define the fluid genre-less boundaries that soon followed: where classic rock, stoner jams, badlands soul, and nitroglycerin funk could mutually co-exist in the same plaintive wail. They may be the first and best post-Outkast rock band. “It Beats 4 U” commences with acoustic guitars and martial drums. James leans towards an existential love song: smoke breathes, time beats, new thoughts arrive and align but then something else happens in the second half. The ideas come alive in the music, almost like fictional characters taking control of a novel. An outer space crescendo where the human voice is turned into a flute. Abduction psychedelia. If you play it on an isolated country road with the windows down and both the music and narcotics turned up to full volume, there’s a good chance you’ll get picked up by some wandering extraterrestrials, or at least get so mesmerized that you’ll crash into the closest grain silo. There is “Gideon,” presumably named after the group that puts those bibles in hotel rooms that you never read. It starts with a synth riff that almost resembles the Alan Parsons “Sirius,” the Chicago Bulls theme song,and proceeds to jump out the gym like Jordan. Written shortly after the invasion of Iraq, it’s highly probable that lines like “we have become feared for something we don’t want/Listen/Listen/most us believe that this is wrong” are the closest that the band came to an anti-war and anti-organized religion song. It’s a piece of an album you’d ostensibly write at 26—where you’re forced to reconcile the way you’re raised with the adult that you’re becoming, trying to pick out the good elements of the former and jettisoning the rest. Whenever James has been asked about the song, he’s claimed it was inspired by a story about a crazy squawking bird on NPR named Gideon. Because sure, why not. Virtuosity can only take you so far. Just look at John Mayer. What made MMJ special was their gift at turning bleak circumstances into joyous celebrations. As “Hey Ya” is to grappling with divorce and infidelity or “Swimming Pools (Drank)” is to chronic familial alcoholism, “What a Wonderful Man” pays tribute to one of James’ former band mates who committed suicide. If you didn’t know any better, you could mistake it for a perpetual summer jam, with the grinding guitars and guitar bridges made for air guitar, empty beer bottles, and ice cream wrappers. It’s everything a rock and roll song should be: making you feel young, reckless, and invulnerable, but imbued with as subtle undertow of gravity. It’s a celebration of life through the dark prism of death. The second half begins with the midnight sweltering “Whiskey Bar” riffs of “Into the Woods.” A bizarre surrealist carnival jag about masturbation, warm showers, babies in blenders, and torched kittens. It warps into the festival glide of “Anytime,” another longhaired shaggy dog guitar song about relationships, the failures of communication, and the occasional Madonna joke. If there is a knock on Z, it’s that the psychedelic excursions come at the risk of the moonlit lovers rock of the At Dawn era. “Knot Comes Loose” remains the exception, suffused with a sad phosphorescence—it’s a declaration of love, the vow “not to let it down,” but ends on the note, “I will remember you,” as though the disintegration is a foregone conclusion. It’s about the walls we build to protect ourselves with age. For some, it’s a wedding song. For others, it’s a commemoration of our personal failings and fickle hearts. And always, James’ astral exaltation proves the truth of Guru’s credo: it’s mostly the voice. If the album starts with a heart beating, it finishes with one bleeding. This is “Dondante,” a staple of the live show, where it can stretch to 15 minutes, a thundering sorrowful Olympian burst of song, full of elegiac sax and possessed guitars. It’s a tribute to Aaron Todovich, James’ bandmate in Month of Sundays, who committed suicide by overdose not long before the recording of Z. They had met in the 4th grade, played in their first band together, and dreamed of going on MTV Unplugged. It’s a story that you probably can relate to. The talented friend that you have that never understands his gifts, who doesn’t want to complain but is always in constant pain. Someone you love deeply but can never bridge that impasse that will allow them to understand how special they are. And then they’re gone. It’s a song about a dream that James has of his vanished friend. They’re little kids again, alive in the classroom, alive in the streets, full of kinetic energy and an unobstructed future. “I had a beautiful dream that he was in heaven and I don’t know what heaven is. But in the dream it was the stereotypical heaven… clouds and sun rays shining through and it was all white and [Aaron] was dressed in a white robe with wings and everything…and he was so happy,” James said about “Dondante” in an appearance on VH1’s Storytellers. This is ultimately that—an album of rebirth infused with the hope that things might turn alright; it’s about mourning the loss of partners and lovers, but also celebrating the emergence of new friends and the potential inherent in each day. This is soul music in the purest sense, raw emotions woven into ghost stories, true fables, and artful complaints, recorded on top of a haunted mansion in upstate New York. They’re too smart to offer a blueprint. After all, everyone’s answers are different. Instead, My Morning Jacket offered something more powerful and universal. They reminded us how much capacity and potential we actually have, should we manage to survive. Z is our album of the month. If you sign up by August 15, you'll receive our exclusive copy of the album, which comes on clear vinyl with blue and black splatter. Our edition also has an alternate cover, and a lyric book.